General Hospital spoilers promise Kiki Jerome (Hayley Erin) is buried soon and Ryan Chamberlain (Jon Lindstrom) is stunned that her mom Ava Jerome (Maura West) is so upset. He thought he was doing her a favor by offing her daughter. But behind the scenes at GH, there’s no drama. 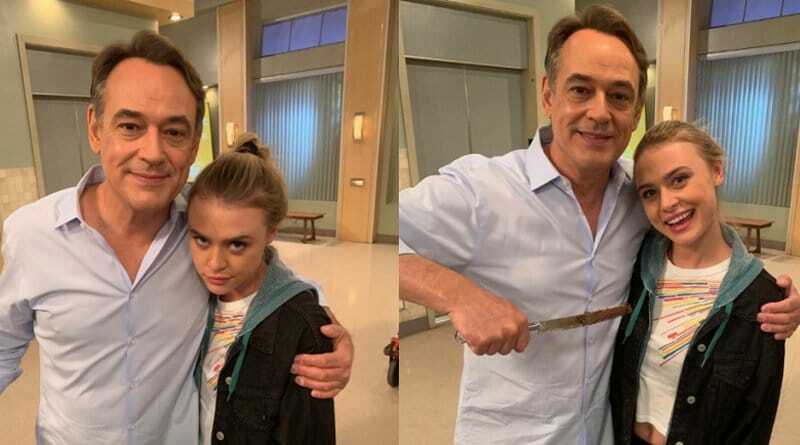 Jon Lindstrom and Hayley Erin staged a funny pic at her farewell party. The behind-the-scenes General Hospital pic (see above) shows there are no hard feelings about Kiki’s exit. Hayley Erin is moving on to prime time as Soap Dirt reported months ago. She filmed her final scenes and at her goodbye party, Jon Lindstrom hammed it up with Hayley for the cameras, mocking the brutal fate of Kiki Jerome. There’s a knife smeared with chocolate icing (not blood) and the two are grinning as he mock-stabs her. Since GH didn’t show the horrific death of Kiki Jerome, this might be the closest fans come to seeing Ryan Chamberlain stab Kiki Jerome. Then again, there could be some greusome flashback footage ahead. Were Those Last General Hospital Scenes for Kiki Jerome? Sometimes General Hospital spoilers hint a character is done, but then they get more scenes. A case in point was Bryan Craig as Morgan Corinthos. He came back as a zombie to torment Sonny Corinthos (Maurice Benard) in visions. Stone Cates (Michael Sutton) came back even though it had been decades since he died. In soap land just because you’re dead doesn’t mean you won’t be seen again. So Hayley Erin may have more scene yet to air. For those GH fans expecting to see Ryan Chamberlain kill Kiki Jerome, there may be flashbacks. Last we saw, Kiki opened the door to a looming Ryan. Then we next saw her as dead at The Haunted Star. The PCPD arrests Griffin Munro (Matt Cohen) Kiki Jerome’s murder next week on General Hospital. Ava comes unhinged and threatens to kill him, as shown in a new GH promo video. Meanwhile, Ryan Chamberlain observes it all with no one eyeing him as a suspect. Yet he wonders why Ava is so upset. Ryan lacks basic empathy and assumed when Ava said she wanted Kiki gone, she meant it literally. Perhaps he expected Ava to jump for joy now that her daughter is dead. Ryan is unprepared for her shattered state but takes it in stride. General Hospital spoilers indicate Ryan plays the supportive lover to see her through the ordeal. What’s Next for Hayley Erin After GH? It seems Hayley Erin exited GH on very good terms. Her new show Pretty Little Liars: The Perfectionists airs on the Freeform network starting in 2019. 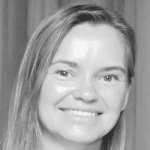 She’s got a featured role although her character name remains a secret. Since Freeform is another ABC/Disney affiliate, Hayley stays in the same network family. General Hospital showrunners write flashbacks and haunting scenes often as recurring post-death appearances are standard for the show. Many Quartermaines returned for visits from beyond the grave, too. Plus, we’ll hopefully get to see the final confrontation between Ryan Chamberlain and Kiki Jerome that led to her death. For new GH episodes, watch ABC weekdays and come back to Soap Dirt often for the latest General Hospital spoilers and news.